I’ll admit that when I want to play photographer, I automatically reach for the kahuna camera. The dSLR is an amazing piece of machinery and I love the kahuna but one thing the kahuna can’t do for me [because of lack of equipment] is macro. I’m not sure if I’d use a macro lens often so I’m not going to spend the bones. And I know that macro lens filters are very handy but I don’t have those either. I just use my point and shoot instead. My Canon PowerShot goes everywhere with me. It’s small enough to fit in every purse I own (or the hubs’s pocket) and you never know when you’ll want to take a picture. Or at I least I never know when I’ll want to take a picture. And it takes a decent photograph – those 10 mega pixels word hard for me. But the macro on this little doodad is so cool. I really should play with it more often. Last week’s subject for the Weekly Photo Challenge was fire. I really wanted a flame (because flames look super fly when pixelated) but I was taking all kinds of “fire” photos just in case my idea wouldn’t work out. After all, fire is unpredictable. But yes, I photographed fire extinguishers, fire alarms, fire signs… and matches. To be more specific, unlit matches. I really liked the photos of the unlit matches. I used my handy homemade light box with a black backdrop. 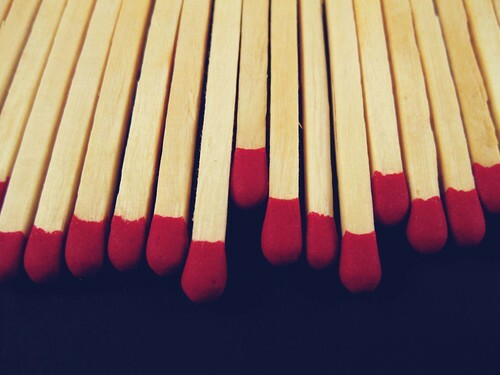 Lined up my matches. Positioned my lamps in a way I liked outside the light box. Changed the camera’s setting to macro, turned off the flash and proceeded to take about 30 different pictures of matches. Each one was different and I tried to move my camera around and at different angles as much as possible. But this one was my favorite. I did some post-processing – I learned a new way to make photos have a vintage look with a blue-hue. And thought it would be cool with the black background and the red tips of the matches. And I’m pleased with it. It’s hard [for me] to find things to shoot with the macro setting. But I’m going to try to use it more often because it does provide a different point of view than if you backed out your shot. A different kind of creative. Different is good. I like different. ~ by shutterboo on January 11, 2010.
cool. Love the red tipped matches. And a big thank you on the light box tutorial. I just might have to make one of those. All the thanks goes to my pal Mrs. Rev – she found a link on the web and made one. And then I was jealous so she helped me make one. And I got my set of macro filters for Heavy D (I think I like that name better than Big D, do you think the real Heavy D would mind?) for something like $30. The set came with a +1, +2, and +3 filter all of which I can mix and match to get up to +5. I know they aren’t too expensive – PodMate has some for her 50mm. I’m lazy. I like Heavy D better too. And what he doesn’t know won’t hurt him. I’m all about giving the cameras nicknames. I’m thinking of calling my PAS Paco. It fits nicely. 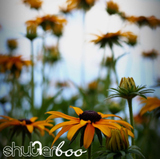 Happy New Year, shutterboo! Love the matches!! Happy New Year to you too, Jun! BTW, that cornbread pic…heaven help my growing waistline. Yeah, Big D makes me think of football for some reason. Heavy D makes me wanna dance. Paco is a great camera name. I wonder if naming cameras is a common practice or if we’re just special like that. Great shot of the matches! I only have a PAS, and it’s not even mine, it’s my Son’s. But it takes wicked macro shots! I tend to do that more than anything else, because I haven’t learned how to take a great shot any other way. Flowers and leaves and nature stuff is great to take a macro shot of, if you ever need inspiration.